While you have probably head it before and chuckled, this can be serious stuff. Yes, we are talking about urine. While it IS worth a laugh, its also a great feedback tool for optimum performance and bodily function. Let's take a look at this a little closer! Here's something you probably didn't know; at least I didn't. Urine gets its color from a pigment known as uroblins. The more water you have in your system, the more diluted your urine, giving it a pale yellow color. On the opposite end of that fact, as you probably could have guessed, is the less fluid you have, the darker your urine will be. Does this give you a bigger appreciation for why hydration is important? It did for me. 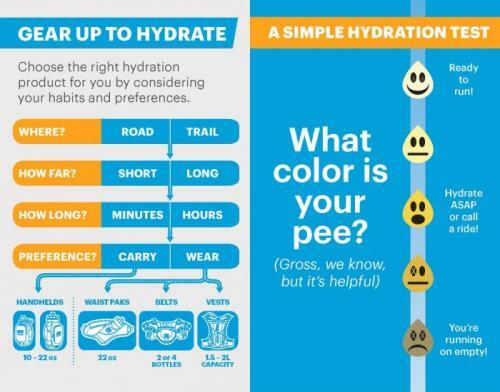 So as you go out for that run or workout this week, take a minute to assess your hydration level and get a hydration plan together to take you to the next level!